Tomorrow, we’ll be done with January. For me, this has been simultaneously a very long and a very short month. I have been doing more writing for other venues this month, which has diverted me from efforts here. Despite the schedule uptick, I have found time to wander my yard long enough to photograph the new growing season’s opening acts. 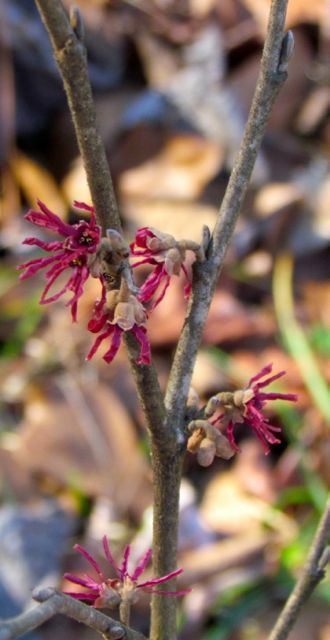 Natives like the witch hazel cultivar above are among the early bloomers, but the showier acts are mostly non-native ornamental trees and shrubs that I added precisely because of their early-flowering proclivities. More than ever, I am merciless in eradicating any non-natives that show signs of potential invasiveness, but the plants in this post have been with me for over a decade, and so far, so good. 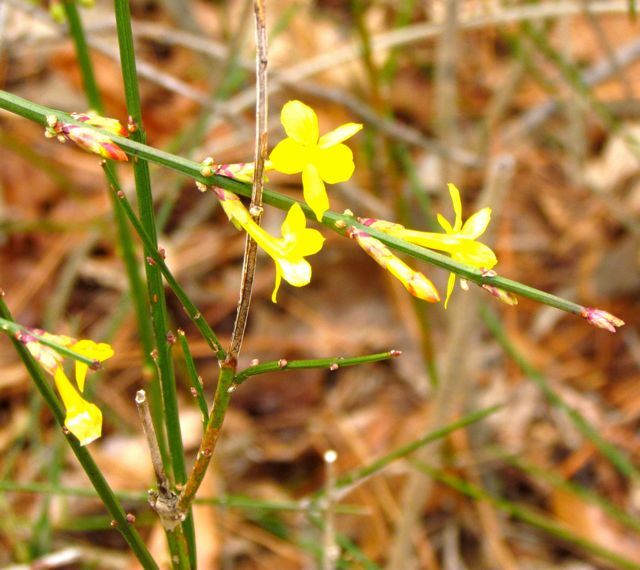 I first met January Jasmine (Jasminum nudiflorum) on the campus of Duke University, where its arching evergreen branches cascaded down a rock wall, its winter flowers a welcome surprise on a dull gray day. I never forgot it, and when we moved to our five-acre paradise, I found a spot for it in the first few years. New flowers after an unseasonably warm rain. From a distance, the botanically unsophisticated mistake this beauty for forsythia. 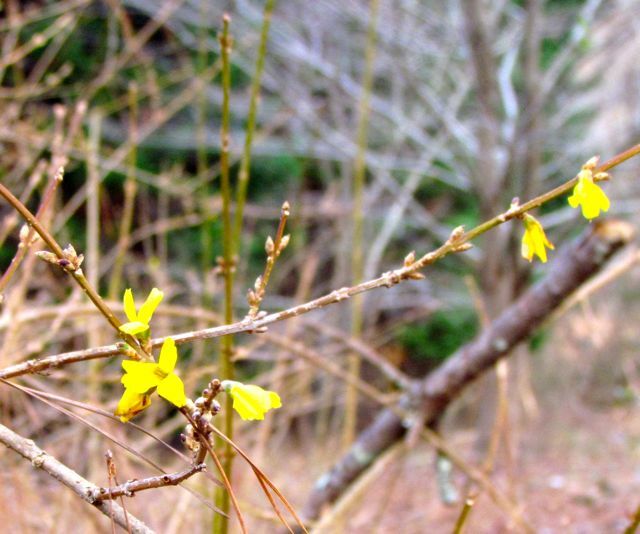 But forsythia is a much coarser, larger plant, and it usually blooms at least a month later than January Jasmine. 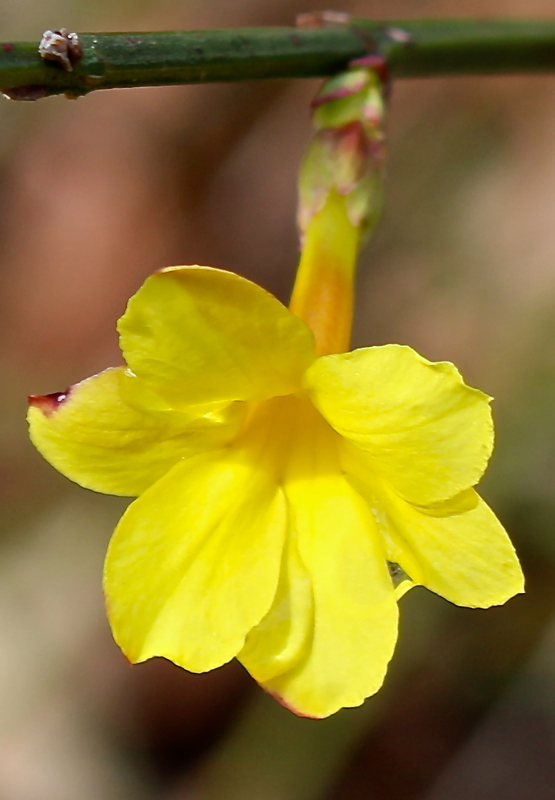 The individual flowers are much more delicate-looking than those of forsythia — at least in this gardener’s opinion. 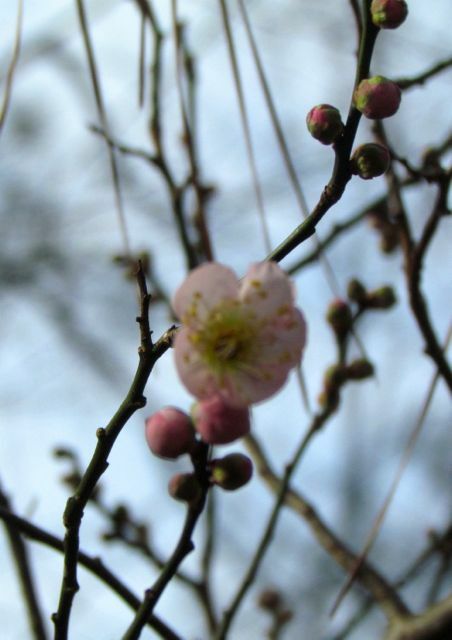 Before the January Jasmine got started, my pale pink-flowering Flowering Apricot (Prunus mume) opened for business. During a recent warm spell, it was covered in ecstatic honeybees from my neighbor’s hive. A week later, my other two Flowering Apricots opened. Theoretically, both are the cultivar Peggy Clarke, but as I wrote here, the flowers are not the same, regardless of the name tags that came with them. As I wrote then, I think of them as Peggy Senior and Peggy Junior, because I acquired Junior later, after falling madly in love with the fragrance of Peggy Senior. I know my enthusiasm sounds extravagant, but trust me, on a cold — or warm — winter’s day no matter how blue you might be feeling, a few deep inhalations of Peggy Senior’s cinnamon-sweet perfume will lift your heart and hopes. 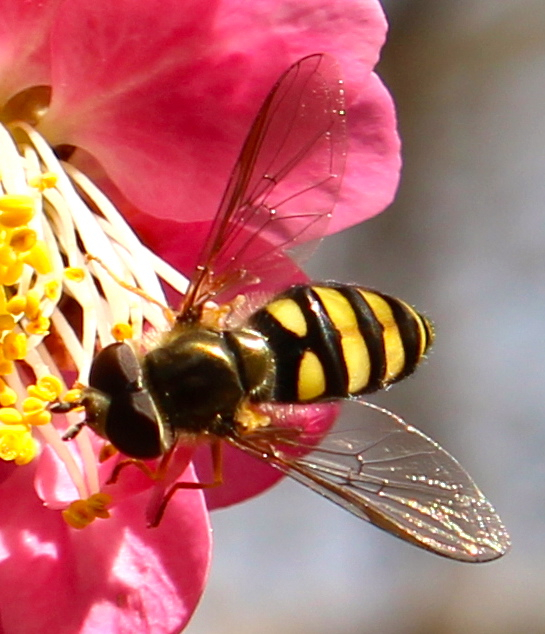 This syrphid fly was quite a surprise. I’ve never seen them out so early. I didn’t realize it wasn’t a honeybee until I looked at it through the camera lens. Most of Peggy Senior’s pollinator visitors have been my neighbor’s honeybees. Peggy Senior is sited behind the south-facing wall of our garage, so she always begins to bloom about a week before Peggy Junior. For comparison, here are a couple of shots of Junior. The differences in their perfume are profound; although pleasantly sweet, Junior’s fragrance entirely lacks the cinnamon undertone that makes Senior so heavenly. Junior’s flowers are also a paler pink. The Green World is my source of solace these days more than ever before. When faced with national and international events over which I have little control — at least until the next election cycle — I have chosen to devote my efforts to where I feel I can be most effective. That’s why I’m stepping up my writing efforts. 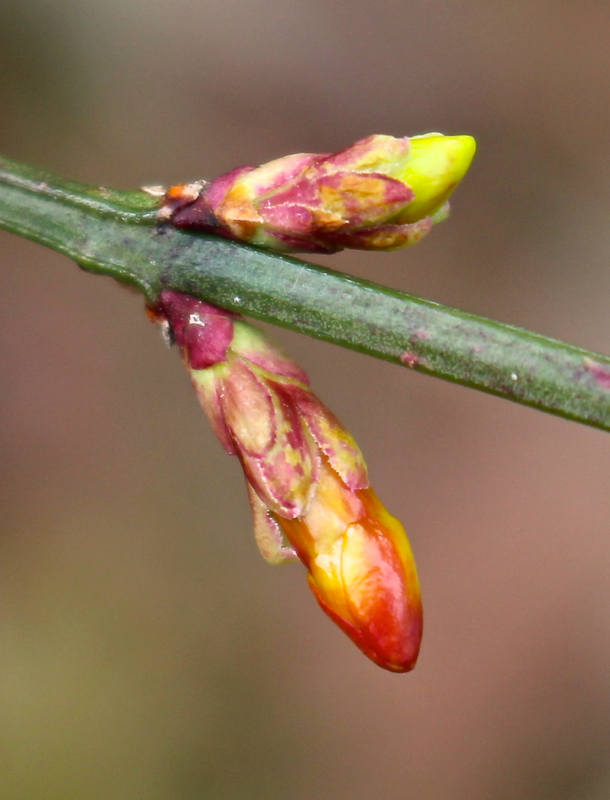 Flower buds of our Cornelian cherries (Cornus mas) are just opening. 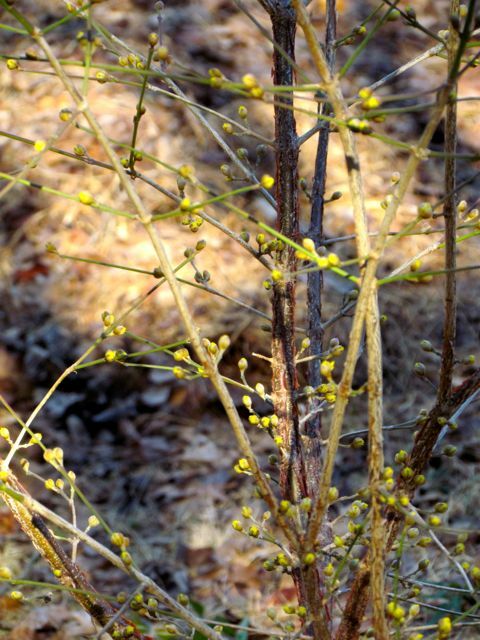 This member of the dogwood family lacks the showy bracts we usually associate with dogwoods, but the bright yellow flowers pop vividly in the late winter landscape. 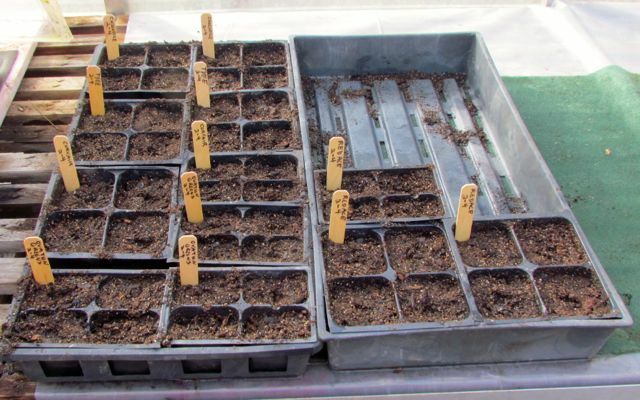 I’m writing a bi-monthly gardening column for a small paper in Virginia in the hopes that I can persuade new readers to more deeply appreciate their native environments. 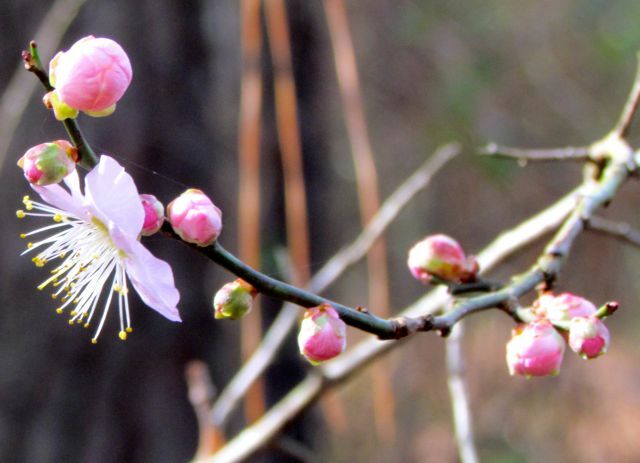 I also recently finished an article for the next edition of Conservation Gardener, the magazine of the NC Botanical Garden that I’m hoping will motivate folks to get serious about eradicating invasive non-native species from urban natural areas in their neighborhoods. 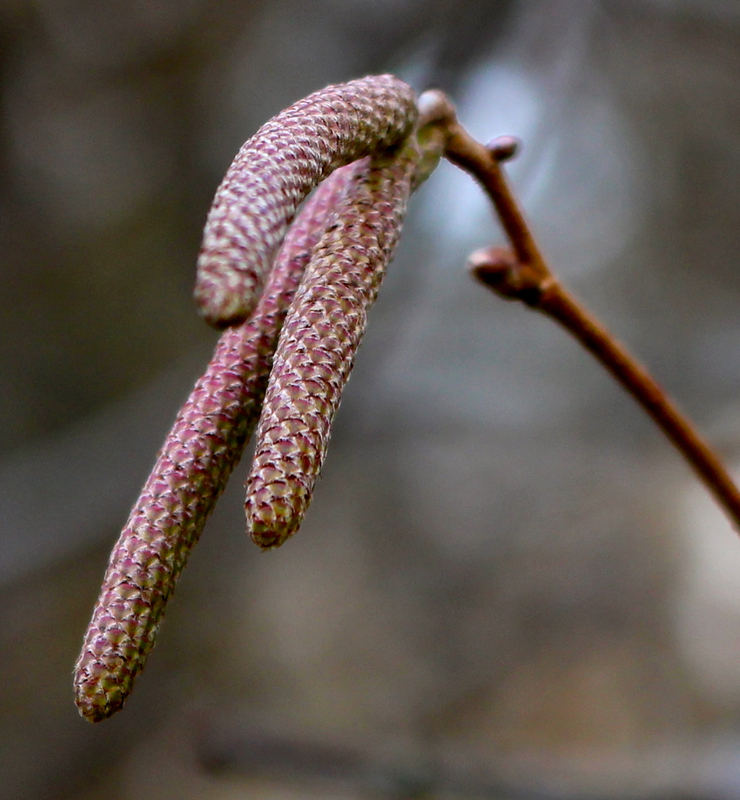 Expanding male catkins of native American Hazelnut (Corylus americana). I’m also deeply involved in helping a local church create a wildlife sanctuary on their property by enhancing it with diverse, abundant native plants. 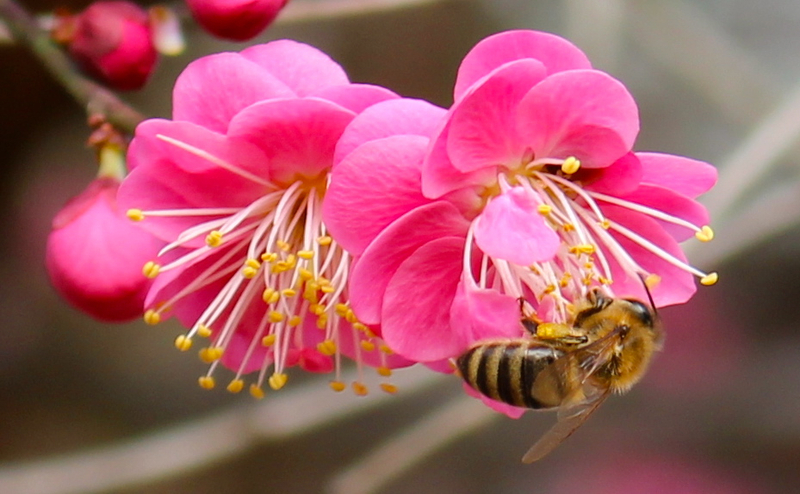 My dream is that all such public places — now mostly “landscaped” with resource-hogging, environmentally sterile lawns and a few struggling, mostly non-native trees and shrubs — can become healthy native havens for struggling wildlife, including vital pollinators. 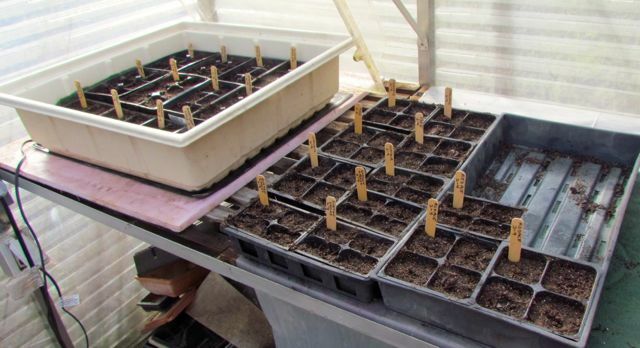 I’m hoping this project will inspire other churches to start their own native sanctuaries, and that as adults and children become familiar with these plants, they will want to plant them in their home landscapes. It’s a big dream, I know, but with so much darkness in our world right now, I feel obliged to think big — and very green. A couple of weeks ago before dawn, we got quite a show just as the moon began to make her descent. 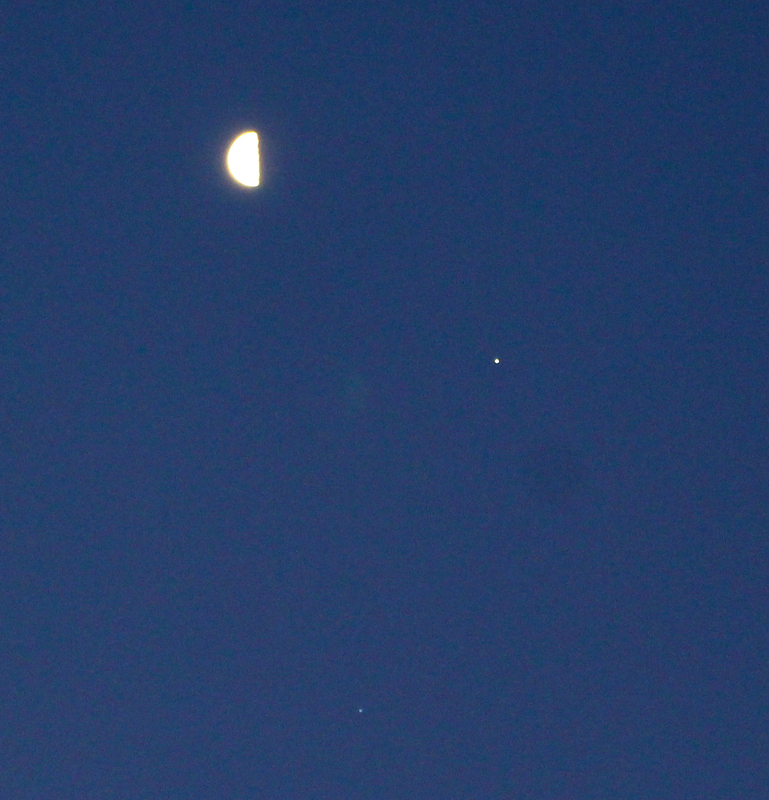 The bright light below and to the moon’s right is the planet Jupiter, shining brighter than most stars. If you look carefully toward the bottom of the shot, you can see a blurry bit of gray light. That’s Spica, the brightest star in the constellation Virgo. This conformation of heavenly lights was a lovely opening act for the sunrise that followed shortly thereafter, and reminded me that there’s more than one meaning to that term. Opening acts can be preludes to main shows, but they can also be behaviors. In this time when political darkness threatens to overwhelm us, I am looking to my early flowers and spectacular sunrises as reminders to keep my heart open despite the palpable fear in the air. The only way to fight darkness is with light, and light comes from loving, open hearts. So I resolve to do my best to keep my heart open through the dark days ahead, drawing strength from the Green World, and praying that sharing it as widely as I can will inspire others to do the same. 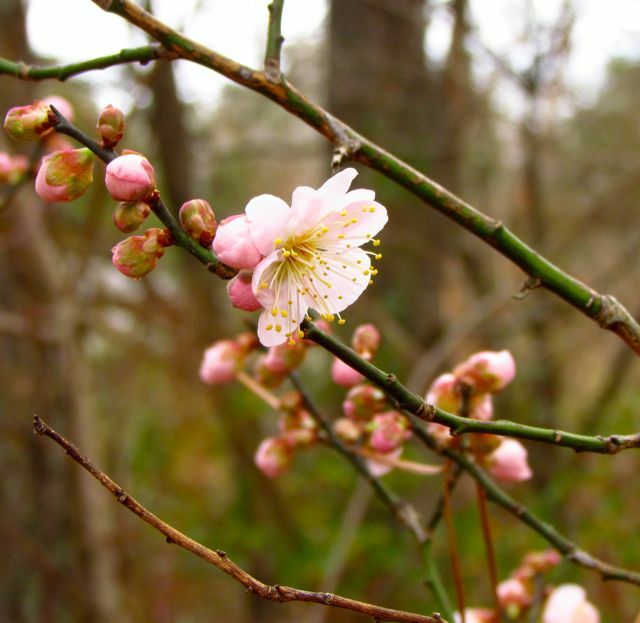 One of the advantages of living in the Piedmont region of NC — most years, at least — is that it is possible to have blooming plants in your landscape every month of the year. 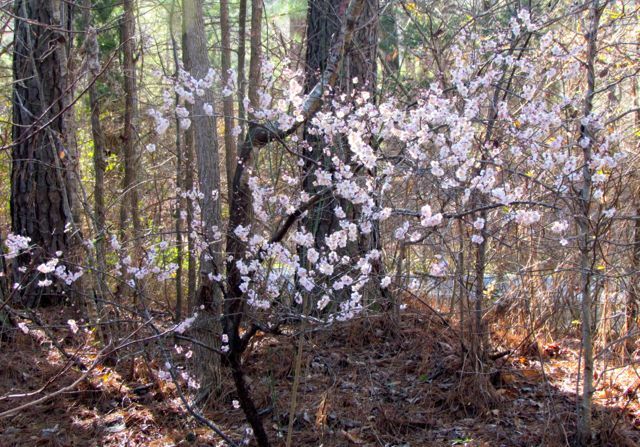 To do it, you have to sneak in some well-behaved non-native beauties, but I think it’s worth it for year-round blooms. Granted, most gardeners aren’t too fond of that little weed above. But I’ve always liked dandelions. 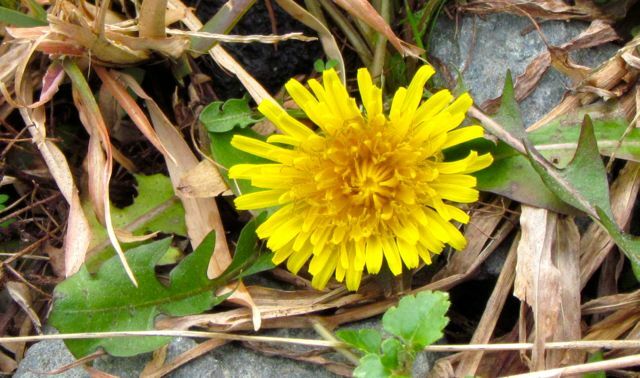 These non-native naturalized weeds were brought to North America by early colonists. 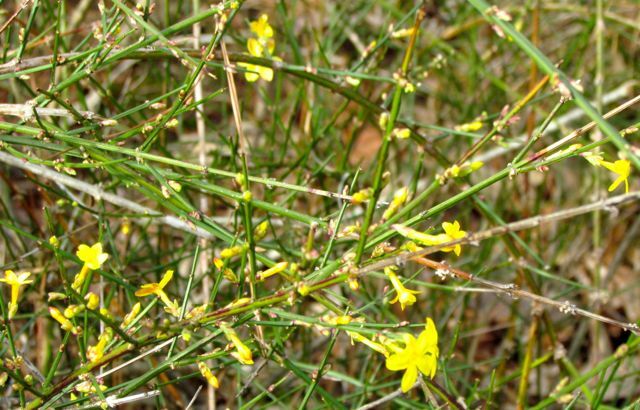 It was considered an essential medicinal plant, and is still consumed in tonics, wines, and salads by many people. 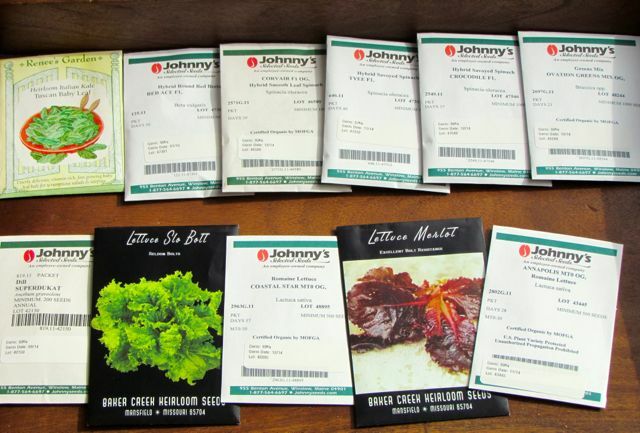 In fact, you can find horticulturally improved dandelion seeds in the greens section of many seed catalogs. In my yard, the dandelions seem to prefer our gravel driveway. I know most folks would eradicate them, but I love their cheerful yellow faces on gloomy winter days. And if it’s warm enough for the honeybees to fly, you’ll find them swarming every yellow lion they see. Most of the flowers blooming today are non-native trees and shrubs, all but one of which I added to our landscape. I apologize for the less-than-stellar photos. My camera objected to the limited light offered by today’s mostly cloudy skies. 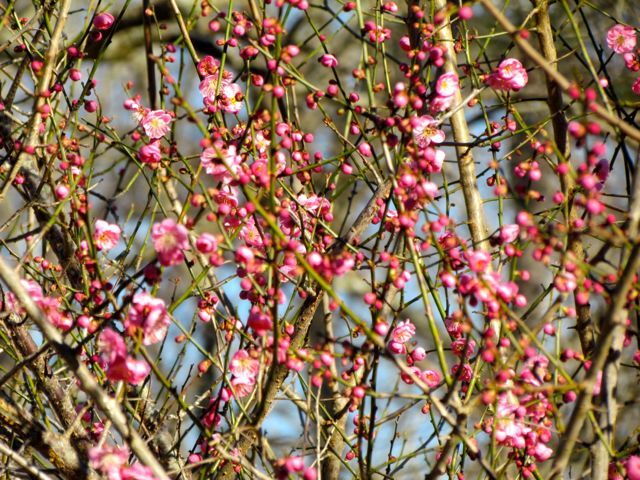 As has been the case in recent years, the pink-flowering ornamental apricot (Prunus mume) variety has begun to bloom before Peggy Clarke. For better pictures of this variety, try here. Right on schedule, the January Jasmine began blooming last week. 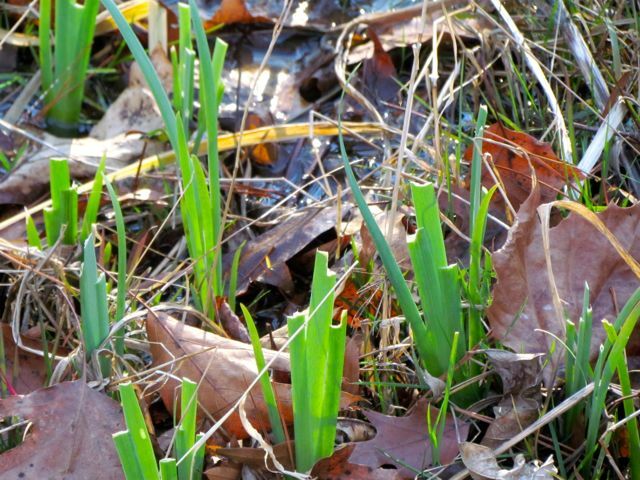 Judging by the number of still-unopened flower buds, it should be brightening the landscape through January. The January Jasmine usually blooms several months before forsythias start, but not this year. Our November was deeply cold, but our December was visited by several very warm bouts of weather. I think this may have prompted the forsythia thicket that grows along my road front to open a few flowers ahead of schedule. 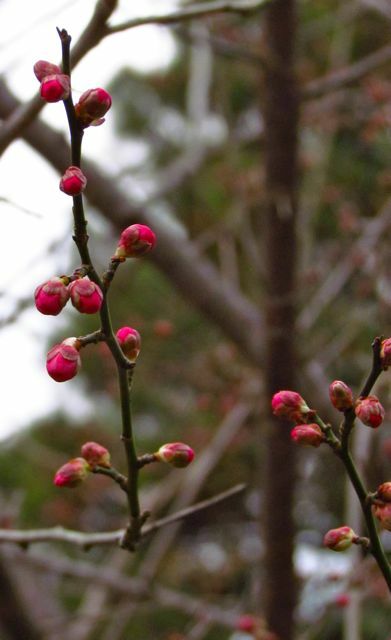 Prunus mume ‘Peggy Clark’ isn’t quite open yet, but many of the buds on both my trees are showing hints of rose pink. And finally, one named variety of a native tree species that I recently added to my landscape is just beginning to bloom. 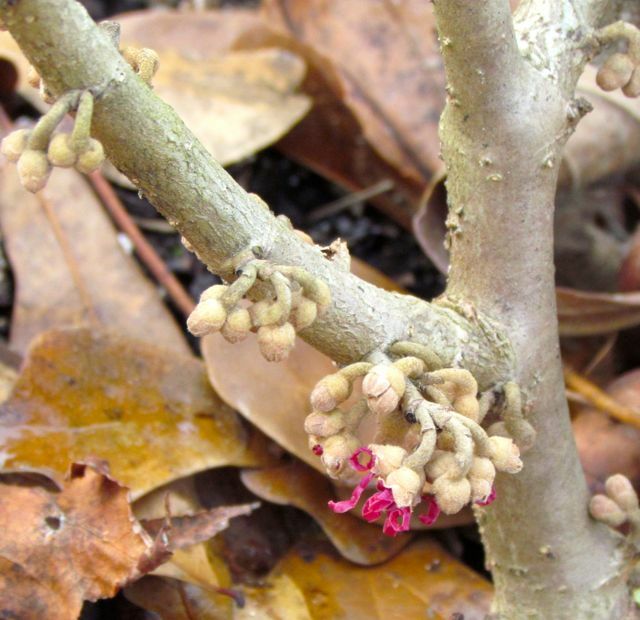 Hamamelis vernalis ‘Amethyst’ has partially opened a set of flower buds closest to the ground, where I suspect temperatures are just slightly warmer. 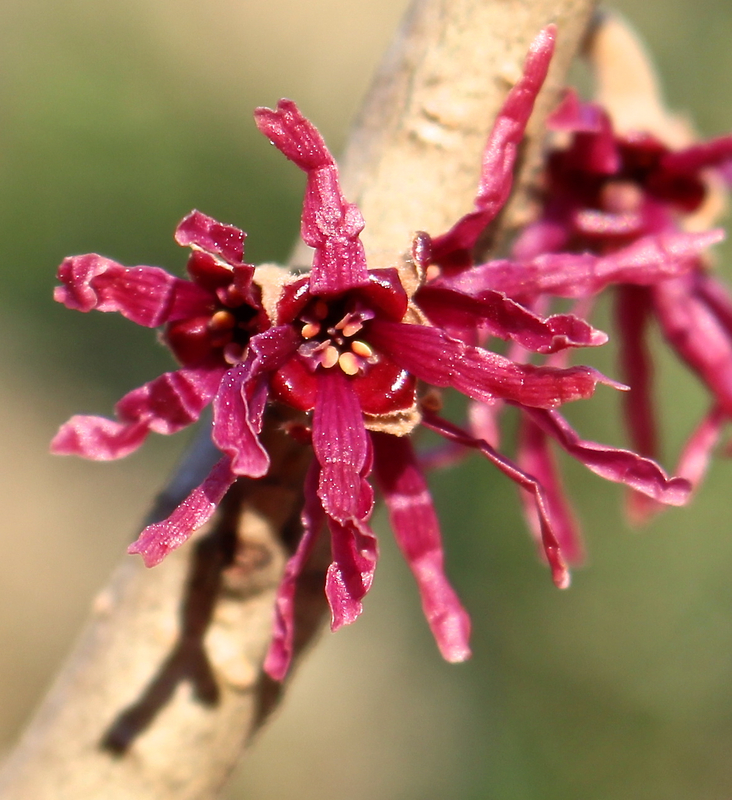 I added this variety of witch hazel specifically for its winter blooms. The strappy purple flowers should be dangling in clusters from all the branches very soon. The ground was too muddy to kneel down for a fragrance check. One other native currently has two sets of flower buds that may manage to open before the next round of deeply cold weather. The coral honeysuckle vine growing on the trellis along my front walk, though mostly devoid of leaves, is sporting crimson flower buds. Such floral enthusiasm is welcome in my mostly drab winter landscape. Every bloom reminds me of life’s persistent resilience, promising Spring’s imminent return. 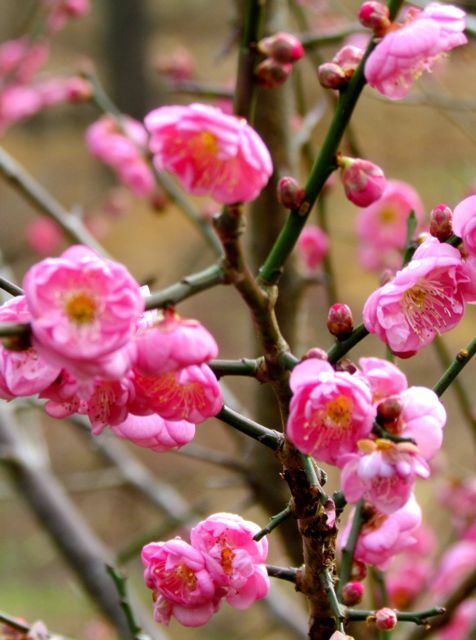 A flowering apricot perfumes winter breezes. 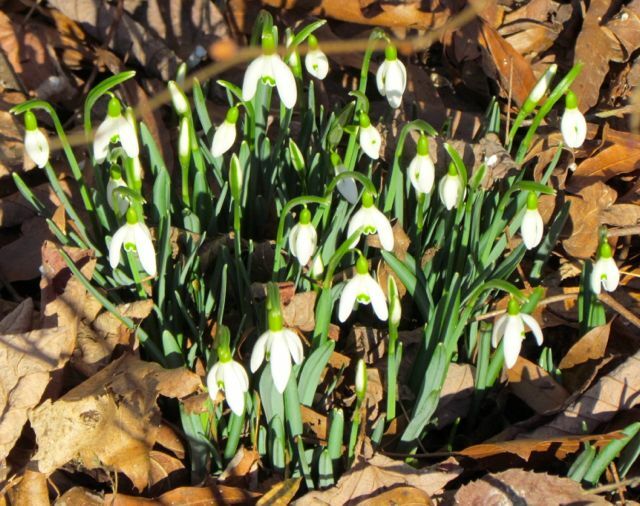 One of the many advantages of gardening in the southeastern Piedmont region of the United States is the relatively mild climate. We get our share of mornings in the teens and twenties in winter to be sure, but the soil rarely freezes, and certainly not for long. By choosing the right plant for the right spot, gardeners in my region really can have blooms in their yards every month of the year. Both of my just-beginning-to-bloom plants are not native to my region. 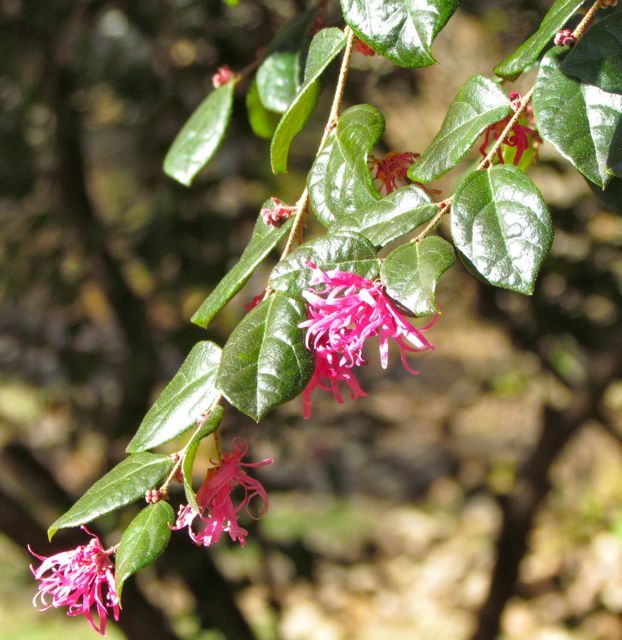 These ornamentals come from Asia, but neither has ever demonstrated any invasive tendencies. 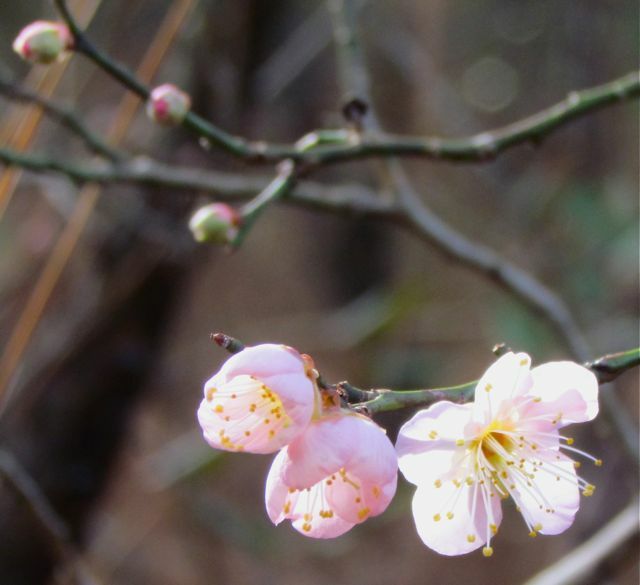 I confess I’ve forgotten the cultivar name of the flowering apricot (Prunus mume) in the top photo. Despite benign neglect on my part, it has thrived for over a decade beneath a canopy of mature loblolly pines. Its fragrance is pleasantly sweet, without the undertones of cinnamon that characterize my other P. mume (Peggy Clarke). The show looks likely to linger quite a while. This small tree is sited near my driveway, where I must pass it to retrieve my mail. It began blooming two weeks ago, and I’ve been making a point of stopping on my way up and back from the mailbox to deeply inhale the scent of these delicate-looking flowers. 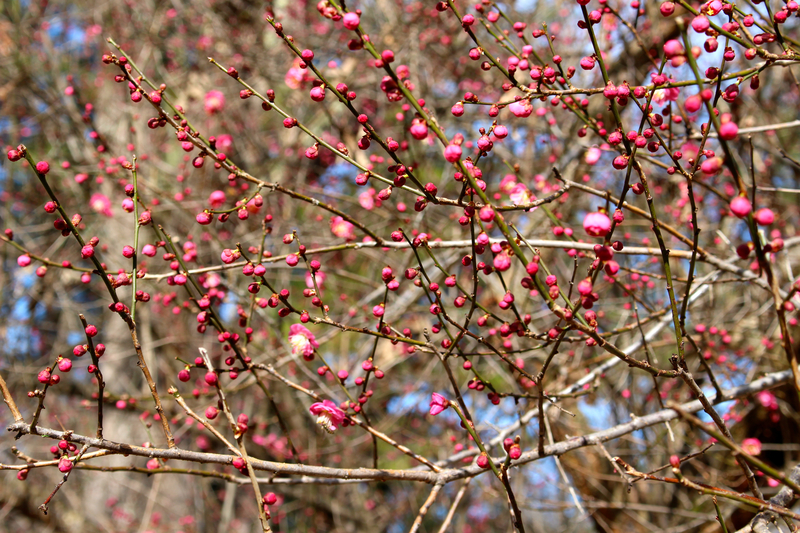 By the number of buds still present, I predict I have at least a month more of flowers from this tree. January Jasmine beginning to bloom a few weeks early. 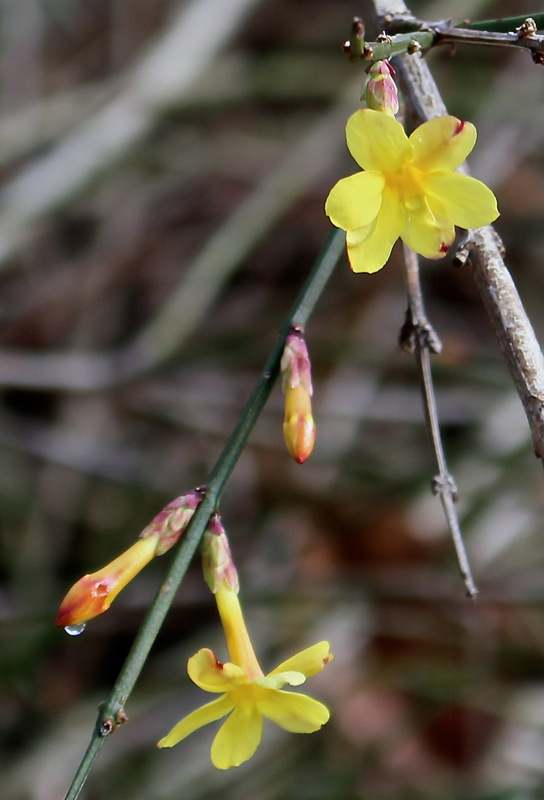 Also just starting to bloom: January Jasmine (Jasminum nudiflorum). I first fell in love with this sprawling yellow-flowering low shrub when I saw it draped artfully over a rock wall at a local college campus. The stems are evergreen, but they must not be tasty, because my neighborhood deer have always ignored my specimen despite easy access. Some folks mistake this shrub in bloom for our ubiquitous forsythias, because the arching branch growth pattern is similar, and the flowers — from a distance — resemble this more common ornamental. But no forsythia I know blooms in December or January, and most years, not even late February. 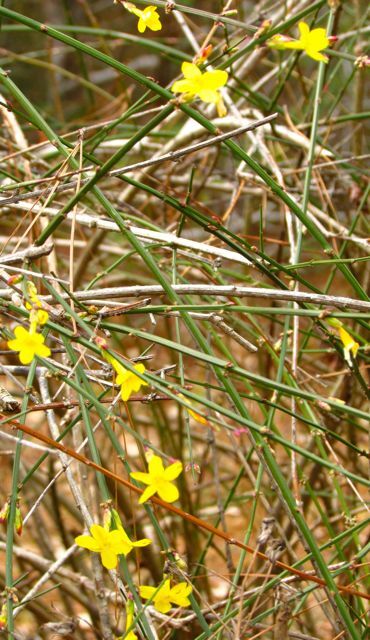 If you live in the Piedmont and see a yellow-blooming shrub with arching branches this time of year, odds are it is January Jasmine. This shrub will be covered in sunny flowers in another week — if ice stays away. January Jasmine needs room to sprawl. Rock walls make excellent supports and also provide a warmer microclimate as the rocks hold on to the heat from weak winter sunshine. I had no convenient rock wall, so I let my shrub form a natural mound that had widened over the twenty years since I planted it. Last year, Wonder Spouse and I severely pruned it back to prevent it from crowding out the daffodils planted near it. This indestructible plant responded by blooming more vigorously than it has in recent years. It will peak in another week or so, as we enter its namesake month. The bright yellow flowers offer no scent, but the flowering apricots more than compensate for that in my yard. 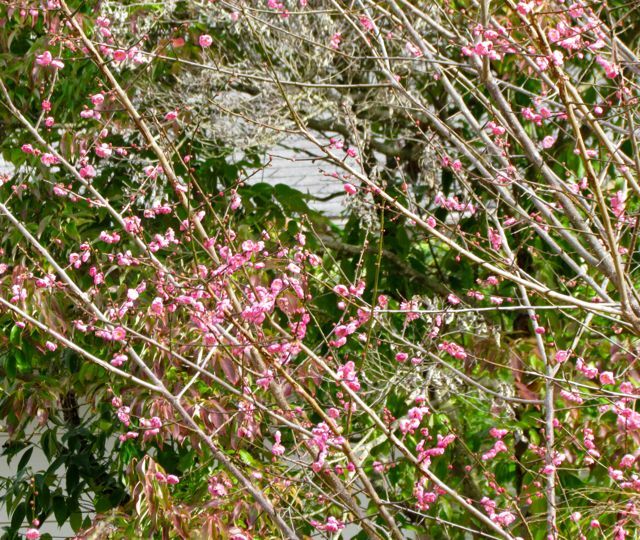 Last but never least, my other flowering apricot cultivar, P. mume ‘Peggy ‘Clarke,’ will be bursting into rosy-petaled, cinnamon-scented glory any minute now. It always opens a week or two after the pink one, even though both of my Peggy’s are sited in warmer microclimates. I know they are worth the wait, and you do too, if you’ve read my earlier entries here and here. 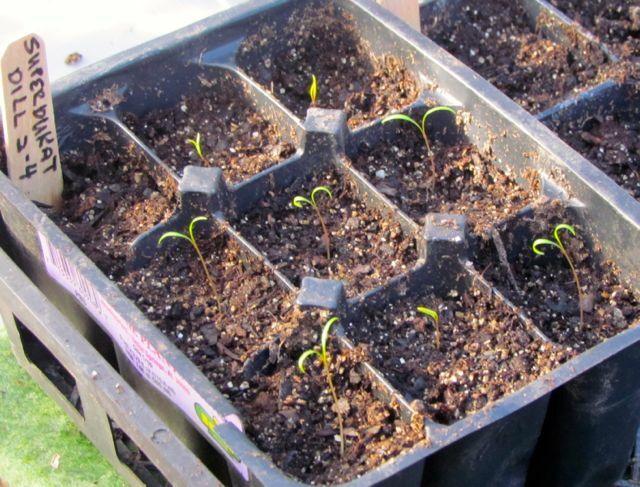 I read a disheartening article today about the latest gardening trends noted by the horticulture industry in the United States. 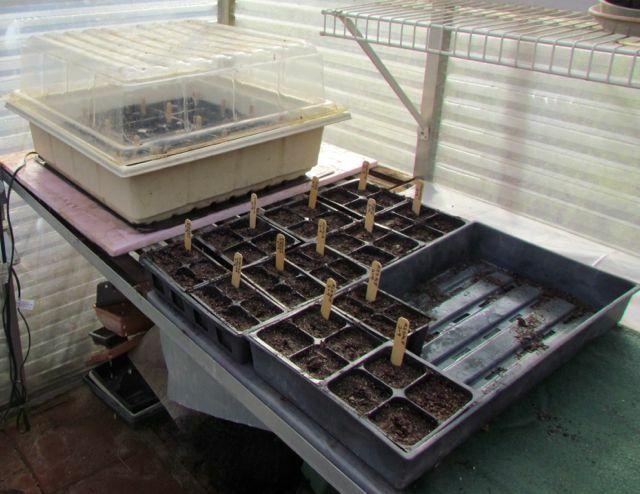 According to their research, younger generations confine their gardening efforts to a few pots on their patios, having no interest in doing anything more than “mowing and blowing” the rest of their yards. I hope this isn’t really true. 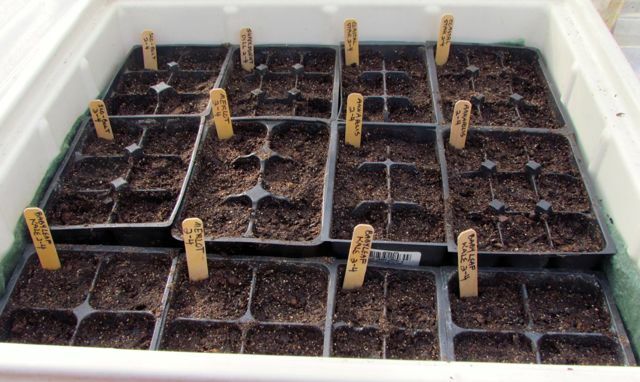 You can’t grow flowering apricots or January Jasmine in pots on your patio. But I promise you, the winter flowers they give you in exchange for a few hours a year of work are worth every drop of sweat and sore muscle accrued on their behalf. 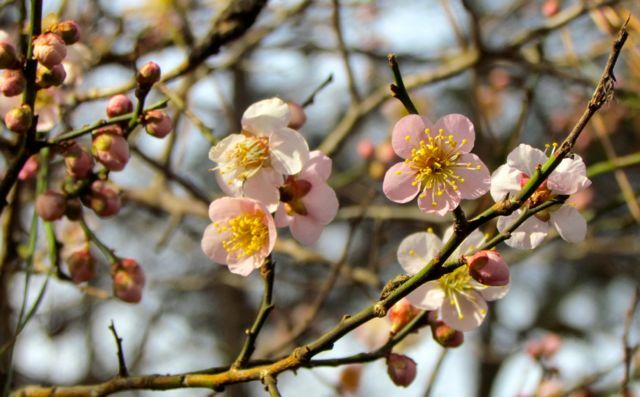 I got myself in trouble with a reader a few years back when I wrote about Prunus mume ‘Peggy Clarke’ in an article for a local newspaper about late winter/early spring bloomers. 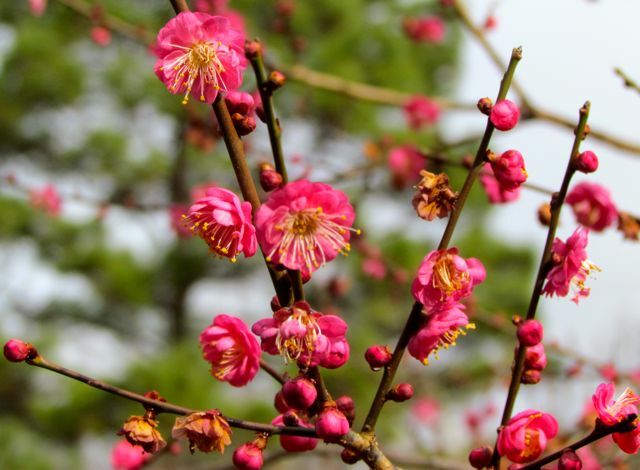 I based the description in my article on my personal experience with the cultivar — a tree currently producing the gorgeous flowers in the above photo. I wrote about how much I love the fragrance of Peggy’s flowers in an earlier blog entry here. I happen to think the color of Peggy’s flowers is quite lovely. Most of the P. mume cultivars I see have much more pastel-colored flowers. 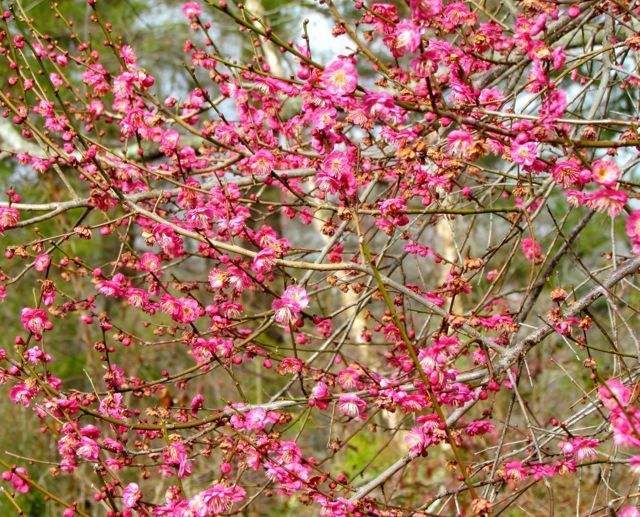 My Peggy’s flowers are a rich, deep rosy pink — a real eye-catcher in the winter landscape. But as I’ve mentioned before, it’s the fragrance of Peggy’s flowers that completely captivates me. 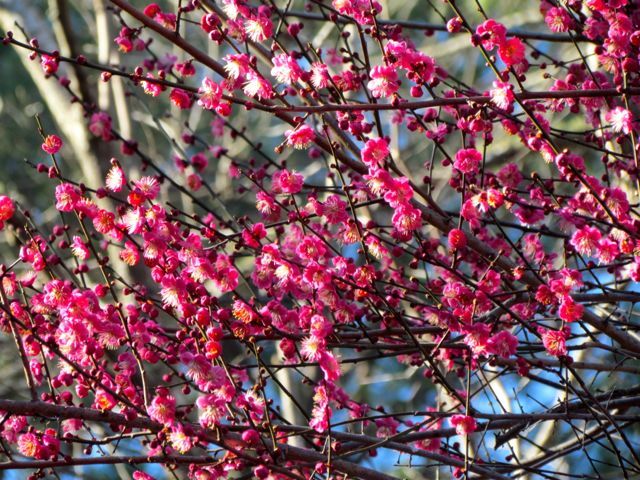 Instead of the lightly sweet fragrance characteristic of most flowering apricot cultivars, my Peggy’s flowers smell strongly of sweet cinnamon. As I’ve written before, if I could figure out how to preserve and bottle that fragrance, I would be delighted beyond words. And that’s how I got in trouble with that reader I mentioned. My enthusiastic prose describing my Peggy’s many wonderful attributes persuaded her to go out and buy the same cultivar to plant in her yard. When her young tree bloomed, I heard from her. The nursery she bought her specimen from insisted that it was indeed P. mume ‘Peggy Clarke,’ but her Peggy’s flowers were not the same color as my Peggy’s flowers — and worse, neither was the fragrance. Not a hint of a cinnamon undertone wafted from her Peggy’s flowers. She wrote, demanding an explanation from me. I didn’t have one, so I conducted an experiment, of sorts. I bought three different P. mume cultivars when they first became available about 18 years ago from a local nurseryman who specializes in choice plants from Asia. A double-flowered white bloomer didn’t last more than a couple of years. Its fragrance was nice, but the tree didn’t bowl me over, and it clearly didn’t appreciate the site where I planted it. I do not remember its cultivar name. 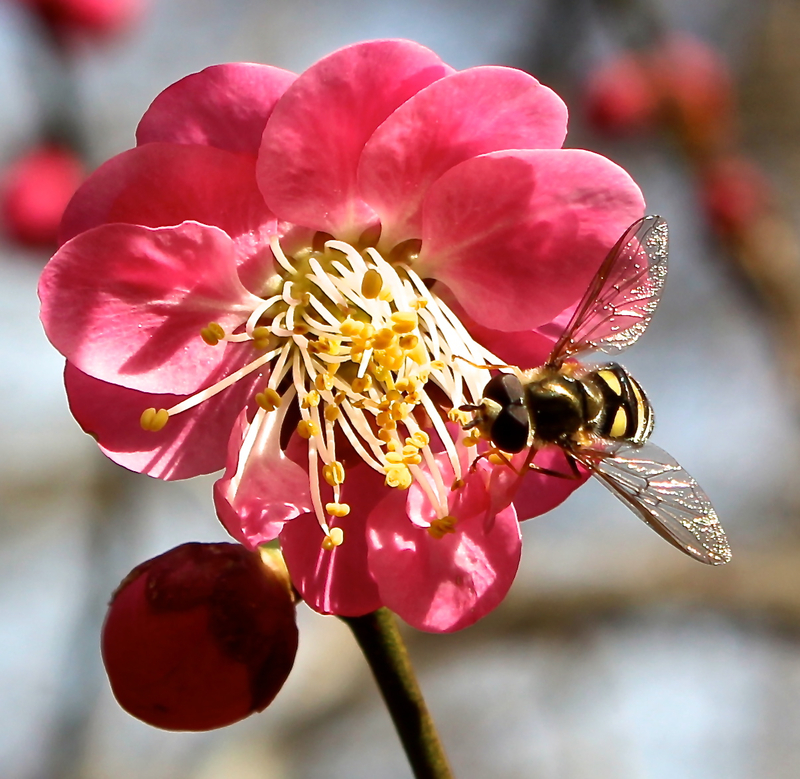 The single-flowered pastel pink cultivar that I showed you here is still with us, blooming reliably every year, and emitting a light, sweet fragrance that is pleasant, but often so faint that I must stick my nose right in a flower to get a good whiff of it (note — check for honey bees before trying this maneuver). The third cultivar I bought was P. mume ‘Peggy Clarke.’ I never forgot her name because she is such an exquisitely memorable tree when her flowers perfume the late winter air of my landscape. No kidding, I stop by this tree every day — rain or shine — when she’s blooming, for a bit of aromatherapy, inhaling the cinnamon goodness of her flowers. Peggy’s fragrance never fails to brighten my mood, no matter how dreary the day. When my reader accosted me regarding her disappointment in buying a paler pink Peggy Clarke with no cinnamon note to its fragrance, I decided to buy another Peggy Clarke. I wondered if perhaps over the course of almost two decades that this cultivar had somehow changed. I think perhaps it has. She’s pretty, I’ll grant you, but if you scroll to the top photo of Peggy Senior, you can’t miss the difference in color. Peggy Junior’s fragrance is also a disappointment. She is sweet, but there is no cinnamon magic in her perfume. She smells like my pale pink single-flowered cultivar — nice, but not intoxicating. I spent some time trying to find a reason for this significant difference in what is supposed to be the same cultivar. 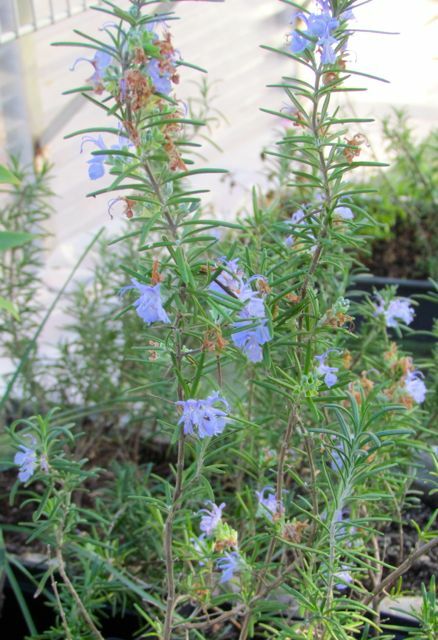 I can’t find a reference anywhere that discusses variation in color and fragrance within the same cultivar of P. mume. Thus, I can only guess at why my Peggy Senior dominates my winter landscape with cinnamon scent and rosy color while my Peggy Junior (four years in our yard now) does not. Guess One: Through an incredible stroke of good fortune, I got a unique specimen unlike all the other Peggy Clarke’s known to the horticulture industry. 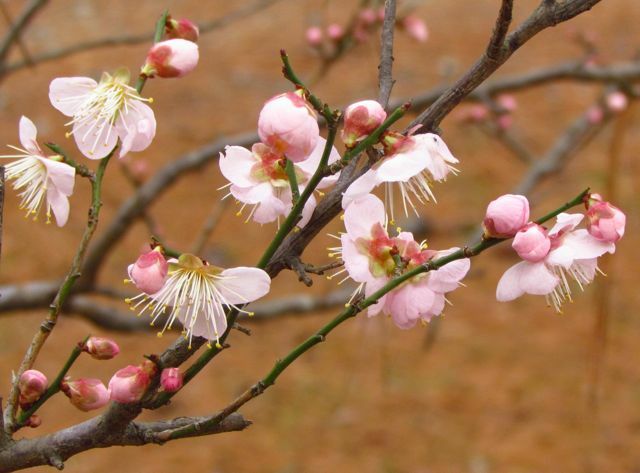 Guess Two: As the popularity of flowering apricots among homeowners exploded, the horticulture industry cut corners to generate sufficient stock to keep up with demand. In so doing, cultivar characteristics were compromised. I have no proof to back either hypothesis. But I am grateful that my obsession with extraordinary plants led me to acquire my original Peggy Clarke when she first appeared in the trade. Be assured that if I decide my landscape needs another Peggy Clarke, I’ll be rooting cuttings from Peggy Senior to ensure I retain this captivating cultivar that perfumes and brightens my winters. I am an early riser. 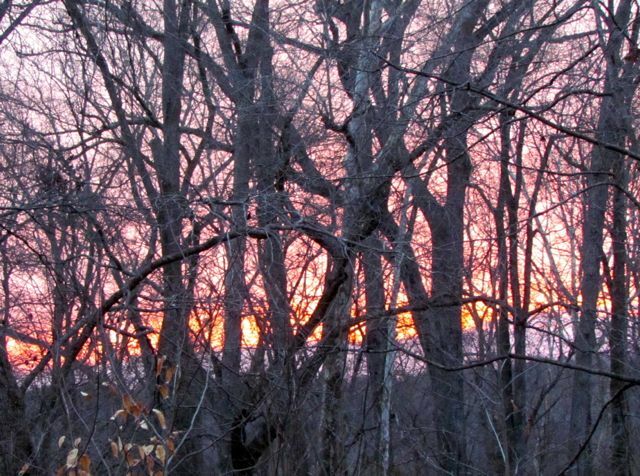 As day length shortens with the approach of Winter Solstice, my early bird nature is often rewarded with breathtaking sunrises, like the one I wrote about here. However, today did not bring fire to my eastern horizon. Today as diamond stars faded into a pre-dawn pearly sky, a pale lavender herd of fluffy cloud sheep galloped toward me from the south. A solid wall of steely clouds loomed close behind them. As the sheep fled northeast before the approaching cloud bank, the eastern horizon showed hints of promising pink and pale gold. The race was on: clouds vs. sunrise. The cloud sheep multiplied, their color deepening to lilac as the sky behind them darkened. Where the sun usually first appears, hints of tangerine promised warmth. Just as I expected to see the first golden rays, the sheep fled, replaced by a sobering wall of gray nothingness. No sunrise for me today. A flat gray sky rules the morning; steel trees silhouetted against it reinforce the monochrome landscape. But Nature has not surrendered to the gloom. 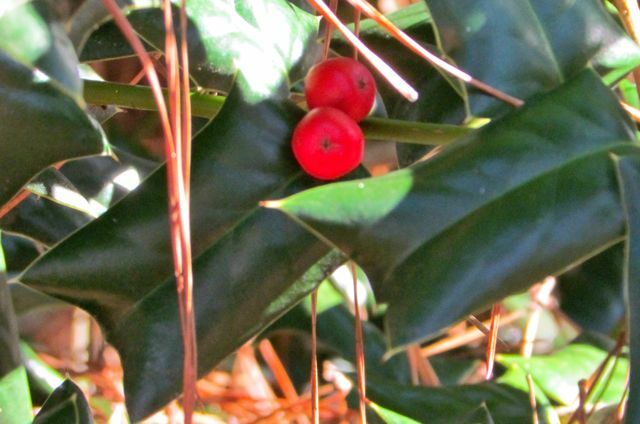 Sharp-leaved hollies glow greenly, their crimson berries brightening the dull air. And then there are the flowers. And, as the flower opening this entry shows, one of my flowering apricots has been in full bloom for a week now. I confess, I don’t remember the name of the variety. Its perfume does not share Peggy Clark’s signature cinnamon scent. But it is still lovely – sweet, but not cloyingly so. I have never, ever, seen it bloom in December. Sometimes by late January, but never early December. Peggy Clark has always bloomed first. Her location next to the garage gives her a flowering advantage. And her buds are close to opening. I’m guessing Peggy will be perfuming my yard by midweek. 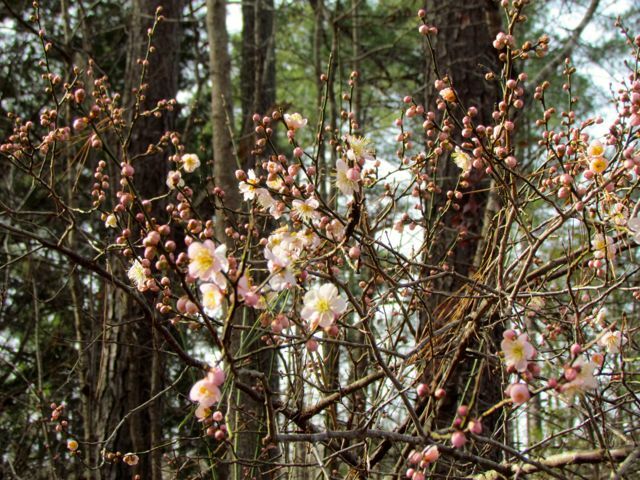 However, this season, this pale pink Prunus mume wins the race. 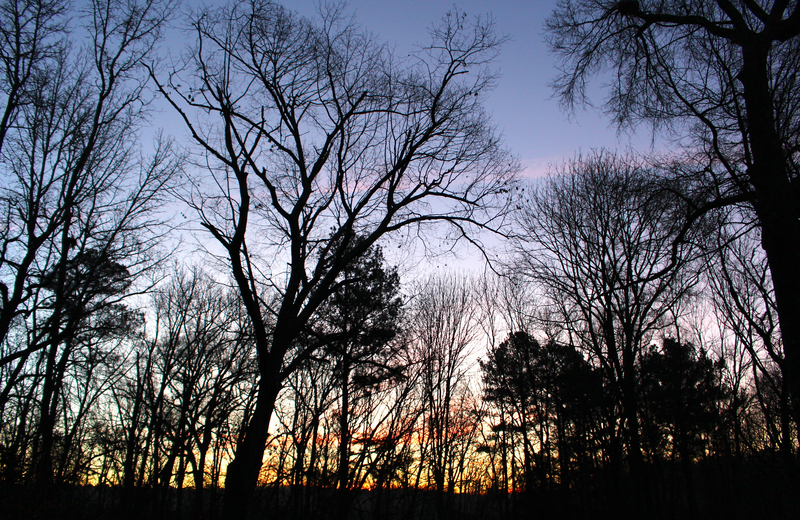 I’m going to cut a few branches to bring indoors before the next cold snap threatens. She has earned a place of honor for her sweet blossoms. But today I’ll enjoy all my December flowers where they grow, and appreciate their colorful punctuation of a monochrome near-winter landscape.